Cassowaries are ratites (flightless birds without a keel on their sternum bone) that are native to the tropical forests of New Guinea (Papua New Guinea and Indonesia), nearby islands, and northeastern Australia. There are three extant species. The most common of these, the southern cassowary, is the third-tallest and second-heaviest living bird, smaller only than the ostrich and emu. Cassowaries feed mainly on fruit, although all species are truly omnivorous and will take a range of other plant food, including shoots and grass seeds, in addition to fungi, invertebrates, and small vertebrates. Cassowaries are very shy, but when provoked they are capable of inflicting injuries, occasionally fatal, to dogs and people. All cassowaries are usually shy birds of the deep forest, adept at disappearing long before a human knows they are there. The southern cassowary of the far north Queensland rain forests is not well researched, and the northern and dwarf cassowaries even less so. Females are bigger and more brightly coloured. Adult southern cassowaries are 1.5 to 1.8 m (4.9–5.9 ft) tall, although some females may reach 2 m (6.6 ft), and weigh 58.5 kg (129 lb). All cassowaries have feathers that consist of a shaft and loose barbules. They do not have retrices (tail feathers) or a preen gland. Cassowaries have small wings with 5–6 large remeges. These are reduced to stiff, keratinous quills, like porcupine quills, with no barbs. A claw is on each second finger.The furcula and coracoid are degenerate, and their palatal bones and sphenoid bones touch each other. These, along with their wedge-shaped body, are thought to be adaptations to ward off vines, thorns, and saw-edged leaves, allowing them to run quickly through the rainforest. Cassowaries have three-toed feet with sharp claws. The second toe, the inner one in the medial position, sports a dagger-like claw that can be 125 mm (5 in) long. This claw is particularly fearsome since cassowaries sometimes kick humans and animals with their enormously powerful legs. Cassowaries can run at up to 50 km/h (31 mph) through the dense forest and can jump up to 1.5 m (4.9 ft). They are good swimmers, crossing wide rivers and swimming in the sea. All species have a keratinous skin-covered casque on their heads which grows with age. The casque's shape and size, up to 18 cm (7.1 in), is species-dependent. Casuarius casuarius has the largest and Casuarius bennetti the smallest (tricorn shape), with Casuarius unappendiculatus having variations in between. Contrary to earlier findings, the hollow inside of the casque is spanned with fine fibres which are believed to have an acoustic function. Several functions for the casque have been proposed. One is that they are a secondary sexual characteristic. Other suggested functions include being used to batter through underbrush, as a weapon in dominance disputes, or for pushing aside leaf litter during foraging. The latter three are disputed by biologist Andrew Mack, whose personal observation suggests that the casque amplifies deep sounds. Earlier research indicates the birds lower their heads when running "full tilt through the vegetation, brushing saplings aside and occasionally careening into small trees. The casque would help protect the skull from such collisions". Cassowaries eat fallen fruit and consequently spend much time under trees where seeds the size of golfballs or larger fall from heights of up to 30 m (98 ft); the wedge-shaped casque may protect the head by deflecting falling fruit. It has also been speculated that the casques play a role in either sound reception or acoustic communication. This is related to their discovery that at least the dwarf cassowary and southern cassowary produce very-low frequency sounds, which may aid in communication in dense rainforest. 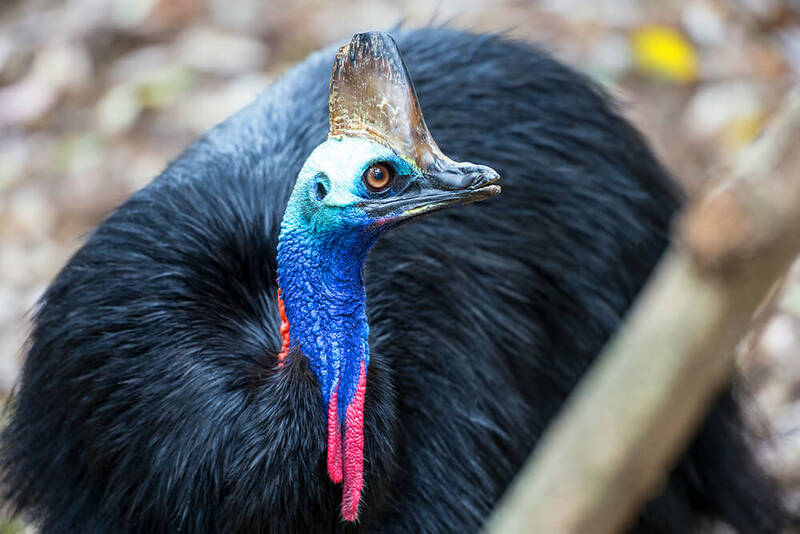 The "boom" vocalisation that cassowaries produce is the lowest frequency bird-call known and is at the lower limit of human hearing. A cooling function for the very similar casques of guineafowl has been proposed. The average lifespan of wild cassowaries is believed to be about 40 to 50 years. Cassowaries are solitary birds except during courtship, egg-laying, and sometimes around ample food supplies. The male cassowary defends a territory of about 7 km2 (1,700 acres) for itself and its mate, while females have overlapping territories of several males. While females move between satellite territories of different males, they appear to remain within the same territories for most of their lives, mating with the same or closely related males over the course of their life span. Courtship and pair bonding rituals begin with the vibratory sounds broadcast by females. Males approach and run with necks parallel to the ground with dramatic movements of the head, which accentuate the frontal neck region. The female approaches drumming slowly. The male will crouch upon the ground and the female will either step on the male's back for a moment before crouching beside him in preparation for copulation or she may attack. This is often the case with the females pursuing the males in ritualistic chasing behaviours that generally terminate in water. The male cassowary dives into water and submerges himself up to his upper neck and head. The female pursues him into the water where he eventually drives her to the shallows where she crouches making ritualistic motions of her head. The two may remain in copulation for extended periods of time. In some cases another male may approach and run the first male off. He will climb onto her to copulate as well. Males are far more tolerant of one another than females, which do not tolerate the presence of other females. The cassowary breeding season starts in May to June. Females lay three to eight large, bright green or pale green-blue eggs in each clutch into a prepared heap of leaf litter. The eggs measure about 9 by 14 cm (3.5 by 5.5 in) — only ostrich and emu eggs are larger. The male incubates the eggs for 50–52 days, removing or adding litter to regulate the temperature, then protects the chicks, who stay in the nest for about nine months, defending them fiercely against all potential predators, including humans. The young males then go off to find a territory of their own. The female does not care for the eggs or the chicks but moves on to lay eggs in the nests of several other males.